February 2nd is Groundhog Day, with key prognosticators in both the US (Punxsutawney Phil) and Canada (Nova Scotia’s Schubenacadie Sam, Alberta’s Balzac Billy and Ontario’s own Wiarton Willie). Willie even has his own statue. As you know, if they see their shadows, it’s six more weeks of winter. If not, bring out the gardening tools. People in Ontario’s the Bruce Penninsula claim 90% accuracy for Willie (it must be sunny a lot up there). He did not see saw his shadow last year, and we all know what happened after that!the temperature was below normal in January-March for all of Ontario. Would a Groundhog see its shadow on Groundhog Day at your school? Step outside on February 2nd and find out. February 2nd is Groundhog Day, with key prognosticators in both the US (Punxsutawney Phil) and Canada (Nova Scotia’s Schubenacadie Sam, Alberta’s Balzac Billy and Ontario’s Wiarton Willie). Willie even has his own statue. As you know, if they see their shadows, it’s six more weeks of winter. If not, bring out the gardening tools. People in Ontario’s Bruce Penninsula claim 90% accuracy for Willie (it must be sunny a lot up there). Would a Groundhog see its shadow on Groundhog Day at your school? Step outside on February 2nd and find out. Why a Groundhog? German farmers used to observe European Badgers to get a sense of spring activity (some thought they could foretell spring), and when they immigrated to the U.S. and Canada and found few badgers, they transferred the tradition to the very common Groundhogs, which begin to emerge in some parts of North America around the second week of February. See what Willie, Sam, Billy or Phil predict this year, as well as your own prediction, and then follow the weather and decide if the prediction(s) come true or not. A good children’s story from the Groundhog’s perspective can be found here. The Groundhog, also known as a Woodchuck or Marmot, is the largest member of the rodent family and a true hibernator. It puts on a thick layer of fat in the fall, and then retires below the frost line (sometimes as much as 5 m under the surface) in its burrow, where it enters a profound sleep. Its heart rate will drop from 80 beats/minute to 4 or 5, respiration to once a minute, and its temperature may drop as low as 30C. Groundhogs will carry some of their fat into spring because when they emerge fresh greens may be weeks away. In true mammalian hibernation, body temperature drops to near the surrounding temperatures (usually slightly above freezing), and heart, respiration and metabolic rates drop significantly. Energy use is 60-98% lower than normal. Periods of deep hibernation last from one to several weeks, with hours of arousal in-between, and arousal may take several days. Towards spring, arousal periods lengthen until hibernation is broken. Other mammals that truly hibernate include the Meadow Jumping Mouse, Woodland Jumping Mouse, Franklin’s Ground Squirrel and the following bats : Little Brown, Big Brown, Northern Long-eared, Eastern Small-footed, and Tri-Coloured Bat. 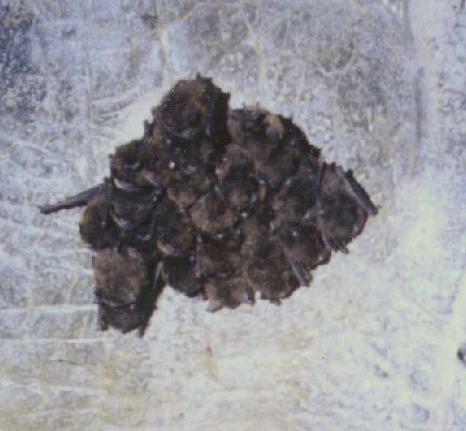 Bats cluster in hibernacula, often caves, and small increases in temperature caused by even careful visitation may rouse the bats too often, leading to starvation and death. 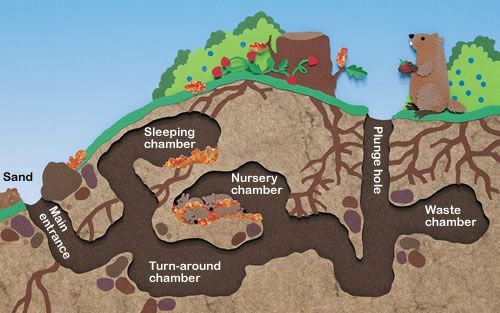 Please avoid known hibernation caves in winter! Many insects also use hibernation-like state called diapause to survive winter including the invasive Emerald Ash Borer which is destroying Canadian trees like Black Ash. This beetle probably arrived here in wooden shipping crates from Asian countries like China and was first detected in Ontario in 2002. It has now spread through southern Ontario into Quebec and threatens forested areas in other provinces. Adult beetles lay eggs that hatch into larvae which burrow through the ash tree bark creating “S” shaped galleries that harm the tree’s ability to transport food and water. The larvae overwinter under the tree bark by hibernating and producing an antifreeze that protects them from temperatures as low as -30°C! This small beetle could have devastating impacts on the forest industry. Ash wood is an important resource used to manufacture items like tool handles and baseball bats. In Canada many of our parks and green spaces have numerous ash trees. The loss of these trees removes valuable wildlife habitat and takes away our shady spaces on a hot summer day! There are now special regulations that restrict the movement of ash wood out of the infected regions of southern Ontario and Quebec but you can also help control this pest. When spring arrives spend some time outside learning to recognize different species of ash trees and report any signs of Emerald Ash Borer to the Canadian Food Inspection Agency at 1-800-442-2342. Meanwhile, if the freezing cold has you feeling like you should hibernate have some fun with these beetle puzzles! The other evening I was driving along a farm road when an Ermine streaked across in front of me. 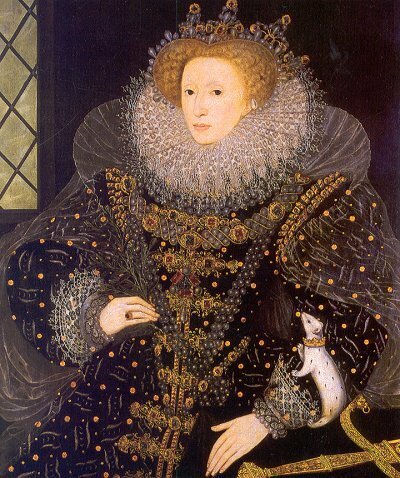 Ermine is just a high-class name for the winter phase of the weasel (or more exactly the Short-tailed Weasel , not the Long-tailed or Least, a pocket-sized carnivore related to American Mink and River Otters (I guess royalty didn’t want others to think they consorted with weasels). Ermine only weigh 30 – 140 grams, and can easily fit down a rodent’s snowy breathing hole and along its tunnels, becoming, along with owls, primary predators of the subnivean (see Late January). Great Horned Owls are calling and are beginning to breed (the first owl to do so). Barred Owls are also vocal, and will respond to call imitations. They are also sometimes seen in parks or wooded areas near or within towns. Snowy Owl sightings continue to be reported so keep an eye out! Get ready to participate in the Great Backyard Bird Count on February 15th-18th – an annual four day event of bird watchers of all ages counting birds to create a real-time snapshot of where the birds are across the continent and in Hawaii. All you have to do is count birds for at least 15 minutes on one or more of the days, fill out the data form, and submit it. Don’t forget to take photos too. Here are some tips for educators to get ready for the count, as well as some bird activities to get students excited. 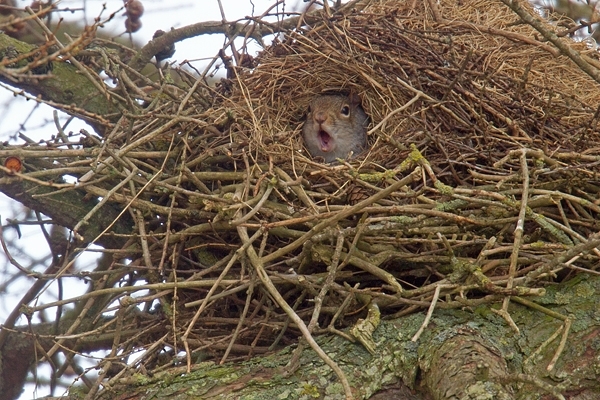 Eastern Grey Squirrels mate this month and there’s a lot of chasing going on related to territory and general amorousness. And keep an eye on those dreys for increased activity. Other mating mammals include Raccoon, Wolf, Coyote, Red Fox, Striped Skunk and American Mink. All develop young (gestate) for about two months, which will place births in April or May, when food is more plentiful, yet a maximum growing period prior to winter still exists. Yes, everything is connected. There’s a lot of survival food being consumed right now – berries and seeds that birds and animals may not prefer (e.g. the fat content is low), but that come in handy towards the end of a hard winter once things like Common Winterberry have already been picked over. Check on Maple-leaved Viburnum, and especially Staghorn Sumac this month, and see if the remaining berries and fruit begin to disappear. On average, the first week of February is the coldest week of the year. Track the temperature, and see how the weekly average compares to recent and following weeks. At the end of the month calculate the monthly average and compare it to the historical monthly average. This could lead to a discussion about the difference between weather and climate. The Pleiades (Seven Sisters) are high in the western sky, eternally being chased by Orion. The related mythology can be found here. 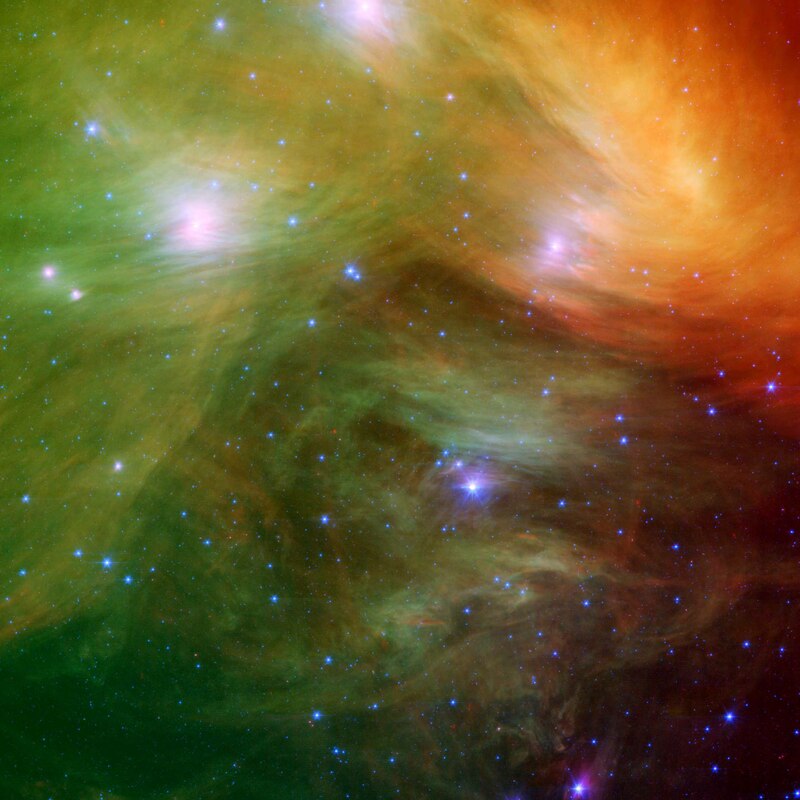 The dust cloud through which this star cluster is traveling can be seen on infrared. Saturn now graces the morning sky, and is near the waning moon on the 2nd. The waxing moon approaches Mars the evening of the 10th.